Crystalline basement of the Kaapval-Zimbabwe Craton extends into Botswana and high-grade rocks of Archean age predominate in the east and southeast of the country. The western margin of the Archean is concealed beneath a cover of Karoo rocks and post-Cretaceous Kalahari Group sediments and Proterozoic orogenic belts are also mostly concealed beneath the Karoo Supergroup strata deposited within the Kalahari Basin which underlies much of central Botswana. In the northwest rocks of Meso- and Neoproterozoic age, most probably belonging to the Damara Belt, occur albeit mainly defined on geophysical evidence due to extensive cover sediments. The important Karoo strata of Botswana have been subdivided into 5 units on the basis of detailed mapping in the southwest of the country. More than 20 kimberlites, predominantly of Cretaceous age, are known from Botswana, however, the exceptionally diamondiferous Jwaneng pipe is of Permian age. Diamond mining has fuelled much of the country’s expansion and thus dominates the national economy and will continue to be its mainstay for the foreseeable future. 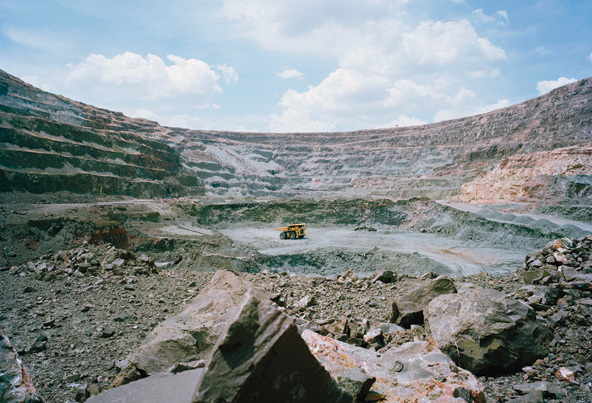 In 2007 mining accounted for about 35 per cent of Botswana’s GDP and diamond production contributed about 77 per cent of the value of the mining sector. Botswana was the world’s leading producer of diamond by value and is ranked second in terms of volume after the Russian Federation. Botswana’s gem diamond production accounted for 26.5 per cent of world and 33.8 per cent of African output. Production declined by 3 per cent in 2008 and diamond revenues decreased substantially due to lower diamond prices. Other mineral commodities have held traditionally significant, though smaller, roles in the Botswana national economy. The country registered significant increases in the production of copper (15.7%), gold (16.7%), nickel (26.7%), cobalt (39.2%) and coal (9.8%) but soda ash output declined by nearly 6 per cent in 2008. It was the second largest producer of nickel (after South Africa) and third largest coal producer in Africa. With the Selebi-Phikwe mine due to close in 2011-12 and large nickel projects due to come on stream in Madagascar and Tanzania it will inevitably slip in the nickel production rankings. Botswana is the world’s third largest producer of soda ash (natural sodium carbonate) and has the second largest reserves after the USA. It also produces salt (9th largest producer in Africa) and semiprecious stones, mainly agate and carnelian. Eastern Botswana has extensive coal reserves (estimated at 17 billion tonnes) and has the potential to develop and support a coal-bed methane industry and additional coal-fuelled electricity-generating plants. Botswana possesses an estimated 212 billion tonnes of coal, much of which is thermal quality and unsuitable for export. Under a conservative set of assumptions, however, the country could export roughly 72 million tonnes a year at peak production. It has been suggested that Botswana's coal should primarily be harnessed for ensuring regional energy security. Arguments in favour of building a Trans-Kalahari railway line (from Mmamabula to Walvis Bay in Namibia) have been critically evaluated. It was concluded that more research was required, but it appears that there are more viable diversification options for the country than to place a primary focus on exporting its coal. "Botswana’s Coal: Dead in the Water or Economic Game Changer?" CIC Energy Corporation is developing the Mmamabula Energy Project, a planned greenfield power station and integrated coal mine in Botswana. 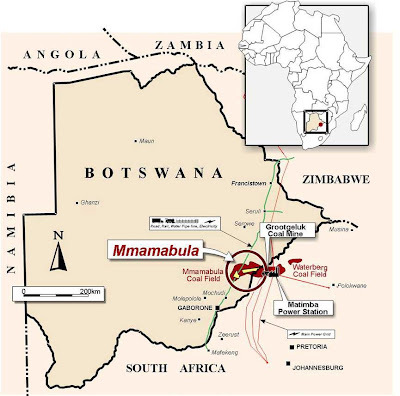 The project consists of two non-contiguous exploration licences, Mmamabula East (50,840 hectares) and Mmamabula South (14,000 hectares), which are wholly owned by CIC’s Botswana subsidiary, Meepong Resources (Proprietary) Limited. The global mineral resource estimate for the project totals approximately 2.3 billion tonnes in the measured and indicated categories. An approximate 74 million tonnes is further reported in the inferred category. The importance of the Indian market for Botswana is reflected in Jindal’s purchase of CIC Energy in Botswana in September 2012.20 Jindal is an Indian company and ‘Botswana remains one of the few “greenfield” deposits in the world and there is every potential that Botswana will become a major supplier to India in the coming decade’. Asenjo Energy will have a memorandum of understanding with a power company by June, 2008, and another with a coal-to-liquid fuel (CTL) technology provider as it proves up some six billion tonnes of coal in Botswana. Asenjo, is 50% owned by Australia’s ASX-listed Aquila Resources and the rest by Jonah Coal, which is equally held by Jonah Capital and JSE-listed coal group Sentula Mining, formerly Scharrig. The Western Mmambula coal field, which is near CIC Energy’s planned Mmamabula power generation plant and dedicated mine, has reconnaissance resources of four billion tonnes. Asenjo is adopting the same model CIC energy has been developing to generate power and produce liquid fuel as well as export coal from its coal field. Aviva Corporation Limited (ASX: AVA) disclosed in February, 2008, that it has an initial resource of 1.287 billion tonnes of coal at the Mmamantswe coal project in Botswana in which it is earning 90%. The resource estimate is based on a 32 hole 3,500 m drill programme. Of these, 23 holes intersected coal. Aviva said a new drilling programme to upgrade the deposit to reserve status is planned to commence in late March, 2008. It will comprise between 150-250 holes. Hodges Resources Ltd's Morupule South Coal Project is located directly to the south of the Morupule Colliery, the only one currently operating in Botswana. The project consists of one prospecting licence (PL121/2010) covering a total area of 264.4km2 within the central eastern district of Botswana. The eastern side of the property is traversed by the 400kv main transmission line interconnecting Morupule Power Stations and the southern load centre (Isang), which lies within the Gaborone radius. The Morupule South Project has a 2.3 billion tonne JORC Inferred coal resource (110Mt measured and 173Mt indicated). A inferred resource was delineated over the prospecting license by independent consultant GEMECS (Pty) Ltd. Geological modelling and coal resources estimates were developed using Gemcom MinexTM software. A-Cap Resources Ltd has announced a JORC compliant coal resource of 107 million tonnes at Letlhakane. This resource has the potential to add significant value to Letlhakane with synergies between mining the coal and uranium ore concurrently under investigation. The Mea Coal Project contains a JORC compliant mineral resource of 335 million tones coal, with an initial 95 million tonnes of export quality coal calorific values of 26.43 Mj/kg (3,313 cal/kg). The Bolau Project is interpreted as the up and down dip extensions of African Energy Resources’ Sese Coal Project (JORC compliant Indicated Mineral Resource of 2.5 Bt), which extends directly onto A-cap’s ground. Bolau has been interpreted as sub-bitumous thermal coal with potential to produce both domestic and export quality products. The Dukwe deposit is an epigenetic quartz-carbonate vein hosted copper deposit. The mineralization lies within a near-vertically dipping, thin, linearly extensive belt of the early Proterozoic Matsitama Supergroup metasedimentary rocks. They are enclosed by sheared granite-gneisses and granites of the Mosetse Complex within the broader structural domain of the Bushman lineament. The metasedimentary rocks and the enclosing granite-gneisses have been flattened, elongated and attenuated within the Bushman lineament shear zone. The primary sulphide consists of chalcopyrite mineralization within a complex assemblage of quartz-calcite veins, breccias and carbonaceous calcareous sediments developed within a limestone horizon of the Matsitama Group sediments. The near surface parts of this zone have been enriched in a supergene blanket, while the parts closest to surface have been oxidized with the development of copper-carbonates and copper-oxide minerals. Outside of the Mining Licence, follow-up drilling was completed in the third quarter of 2007 to examine targets identified through a geophysical survey. It is the Company's intention to search for open-pit deposits in these areas. Drill results are being compiled as assays are received. Exploration continues in the vicinity of the Thakadu deposits to define further mineralisation that may enhance the economics around a stand-alone plant at the deposit. Alternatively, the Thakadu deposit may be scheduled into the Mowana life-of-mine plan, if insufficient material is identified to support a stand-alone operation at this site. Work continues at Nakalakwana Hill where a low-grade copper-gold system has been identified. Results of a 7-hole Phase 1 drill programme will be released by the end of November 2007. A Phase 2 programme has commenced with two holes completed to date. Surface trenching at Gaokae has been completed and results are being received for a large scale geochemical survey that has been completed over this area. Gaokae is a nickel target within ultramafic to mafic intrusions at the basal part of the Matsitama schist belt. Mowana is part of the group's wider Dukwe asset. Exploration within the Mining Licence has encountered new mineralization about 350 metres south of the pit boundary, and drilling in the second and third quarters of 2007 concentrated on the delineation of this new resource that can be incorporated into a mine plan. 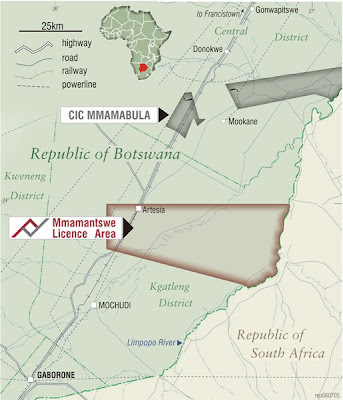 Discovery Metals Ltd (Australian) is exploring seven prospecting licences covering an area of 6,333 square kilometres in north-western Botswana., called the Maun Copper Project. The project area covers a large area of significant copper-silver mineralization within the Ghanzi Formation. Copper-silver mineralization has been previously traced for over 300km of strike. Located within the project area is the Zeta Inferred Copper Resource (20Mt @ 1.2% Cu), and other occurrences of copper mineralization at the G Grid North and P Grid prospects. The existing copper-silver mineralization grades from 0,5% to 9,2% copper with silver grades up to 150 g/t. Mineralization widths vary from 1 m to 23 m with the majority of intercepts in the range 7-15 m. The company said on 25 September, 2007, drilling at a 5.5 kilometre long zone of copper-silver mineralization at the project's Plutus prospect had confirmed that the highest grade mineralization occurs on the footwall/hanging wall contact with grades up to 2.6 percent copper being recorded, and these intersections plunge shallowly to the southwest. The programme has concentrated on defining the mineralisation able to be extracted in an open pit with the majority of drill holes less than 120 metre vertical depth, the company said.The Plutus prospect occurs five kilometres to the northeast of the Petra Inferred Mineral Resource where a series of historical diamond drill holes intersected 1.5 percent copper over a strike length of five kilometres and has an inferred mineral resource of 4.5 million tons at 1.1 percent copper at a 0.6 percent copper cut-off. Discovery Metals announced in December, 2007, a further 46 percent increase in the copper resource at the company's wholly-owned Maun project in the NorthWest District, bringing the total resource in the project to 46.1 metric tonnes. Discovery has also started a regional exploration program on the Maun Copper Project to find new mineralisation outside the currently defined resources at Zeta, Plutus and Petra. 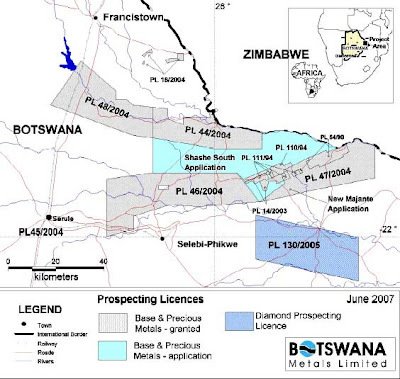 Discovery Metals on 5 July 2013 reported that its Boseto operations, in Botswana, had achieved a record metal production in June 2013 of 1 952 t of contained copper and 81 380 oz of contained silver. This reflected a 14% increase in copper production and an 8% increase in silver production on the mine’s May performance. The company said in an operations update that some three-million tons of material was moved from its two operating openpits. Discovery added that the June performance outcomes continued the ramp up in copper production and added that further improvement was forecast for July. Cupric Canyon holds a 100% interest in the Khoemacau Copper Project in the Kalahari Copper Belt of Botswana, and acquired the adjacent Boseto licenses and mining complex. In the three years since acquisition of the Khoemacau property, Cupric has completed 187,000 meters of diamond drilling, feasibility studies and secured a mining license. The Zone 5 deposit has current resources of 76.3 M tonnes @ 1.96% Cu and 19.8 g/t Ag (40 M tonnes of measured and indicated). Cupric is targeting 100 million tonnes of total resource on completion of the 2015 program, which will still leave the deposit open at depth and along strike. Hana Mining Ltd (TSX VENTURE:HMG) is drilling its Ghanzi Copper Project in northwestern Botswana. The program is proposed to include 10,000 meters of diamond drilling and will initially focus on twinning RC and diamond drill holes in the highly prospective H-I grid area of the property. The program will test both high-grade and lower-grade mineralized intercepts. he H-I grid area was the focus of much of the historical exploration completed at the Ghanzi property previously drilled by Delta Gold in joint venture with BHP Billiton in 1999 and Anglo American Corp. in the early 1990s. Tsodilo Resources Ltd's subsidiary Gcwihaba Resources (Pty) Limited has been granted 20 prospecting licenses for metals covering an area of some 15,000 square kilometers. The prospecting licenses are located within the nascent Okavango Rift System which is part of the East African Rift System. The Okavango Rift System takes advantage of the pre-existing structures of the northeast trending NeoProterozoic Pan African Orogenic Belt known as the Damara Belt. The Damara Belt is largely hidden beneath younger sediments in northwest Botswana, such that our knowledge of much of the geological and tectonical evolution relies on observations of the well-exposed lithological correlatives in Namibia. The Damara belt is known as the inland branch of the Damara Orogeny in Namibia, formed during a high angle collision of the Kalahari and Congo cratons, with the Kalahari sub-ducting northwards below the Congo Craton. The belt is estimated to have evolved within a period spanning from 580Ma to 505Ma. The aeromagnetic data shows that the Damara structural trend is deflected from a northeast to a north to northwest trend in the area around the Panhandle Prospect. This deflection as well as our drill results indicate that this area is part of the Lufilian Arc structure. The Lufilian Arc hosts the world's largest copper-nickel-cobalt deposits in both Zambia and the Democratic Republic of Congo.
" Diamond juniors push ahead in Botswana projects"
In early 1967, after a 12 year search, a team of De Beers geologists found abundant quantities of ilmenite and garnet - two of the chief indicators of diamondiferous kimberlite - near the village of Letlhakane in north-central Botswana. After further exploration, the pipe at Orapa was found later that year. Dr Gavin Lamont (centre) and geologists at Orapa's discovery pit in 1968. The Orapa diamond mine is located about 240 km west of Francistown in north-central Botswana, in southern Africa. The Orapa kimberlite, along with two other significantly diamondiferous kimberlites in the same area, was discovered in 1967 by De Beers geologists and is the largest in a cluster of over 50 kimberlites. The mine was opened in 1971. The commissioning of the No.2 Plant in December 1999 resulted in a doubling in annual production to around 12 million carats in 2000. Orapa produced just over 16.26 million carats of diamonds in 2003. In 2002 production totalled 14.33 million carats of diamonds from 16.4 Mt of ore treated at a recovered grade of 86.85 cpht (carats per hundred tonnes). The total waste removed in the same year was 8.12 Mt. Reserves + resources in 2000 totalled 653 Mt @ 49 cpht diamonds (=320 million carats). The 93 Ma Orapa kimberlite intruded granite-gneiss and tonalite of the Palaeoproterozoic Magondi mobile belt, just east of the Archaean Zimbabwe craton, and on the northwestern margin of the subsequent Kaapvaal craton as well as a variety of rocks from the Mesozoic Karoo Supergroup. While it might be regarded as unusual for a highly diamondiferous kimberlite to be emplaced into non-Archean crust, isotopic evidence from peridotite xenoliths at the nearby Letlhakane kimberlite suggests that the underlying mantle lithosphere is Archaean in age and probably a western extension of the Zimbabwe block. The AK1 kimberlite covers an area of118 ha at surface, although it comprises two individual intrusions that coalesce near the surface. Rocks from all three facies (crater, diatreme and hypabyssal) have been identified, with the former being particularly well preserved. These intrusions have been labelled the "northern" and "southern" lobes respectively. Clear differences exist in the geology of the two pipes. The northern lobe predates the south lobe. Current mining is restricted to the crater facies units which exhibit a wide variation in type and texture, from primary pyroclastic deposits to epiclastic examples where reworking of the material is obvious. The final post-eruptive phase in the life of the crater was marked by deposition of reworked and resedimented epiclastics which in turn, can be subdivided into the crater lake deposits (lacustrine shales and grits) and mass and grain flow deposits (massive breccias, bedded grain flow deposits, debris flow breccias, and boulder beds). Unequivocal hypabyssal facies kimberlite has only been intersected at depth within the mine, with two mineralogical varieties being identified, namely: i). a phlogopite-monticellite variety and ii). a monticellite kimberlite. Diatreme facies kimberlite occurs in both lobes. The "northern lobe" exhibits a gradual transition from the northern pyroclastic kimberlite into a massive, unstructured tuffisitic kimberlite breccia. In contrast, the diatreme facies in the "southern lobe", show a sharp contrast with the overlying southern volcaniclastic kimberlite of the crater facies, and the possibility of a multiple eruption history, particularly with respect to the diatreme facies units, cannot be excluded. These pipes (B/K1, B/K9, B/K12 and B/K15) were were discovered during exploration undertaken between 1967 and 1972. Damtshaa is expected to yield 5 million carats of diamonds from 39 Mt of ore mined over a 31 year mine life. The B/K1 pipe was discovered by reconnaissance soil sampling in 1967 and was the first kimberlite to be discovered in the Orapa/Letlhakane province. It is 15 km north of Letlhakane village and covers an area of 5.5 hectare as a 600 x 50 to 150 m, north-south elongated body, exposed as a calcrete capped topographic ridge with little or no soil cover. Soft, calcrete altered kimberlite underlies the hard surface calcrete at a depth of 1-2m. The main, northern section of the pipe is a hard, hypabyssal kimberlite with a low diamond content, while the southern section is composed of soft, highly altered tuffisitic kimberlite breccia and covers approximately 1.1 ha. The B/K9 kimberlite was discovered 3 years later in 1970 from follow-up of a 1969 airborne geophysical survey by air core drilling through 10 m of sand and calcrete cover. The sub-outcrop area of of the pipe is 11.4 hectares, with a 600x300m NW-SE elongation. It has no topographic expression. Near surface, the pipe comprises two lobes of hypabyssal kimberlite at either extremity of the long axis, separated by a breccia composed of basalt wallrock clasts, up to several metres in diameter, enclosed within a weathered/altered kimberlite matrix. This latter lithology may represent a crater facies breccia basin. The basalt clasts comprise between 25 and 75% of the unit, which is between 80 and 110 m thick. Underlying the breccia basin, and invading the hypabyssal lobes are a number of intrusions of both tuffisitic kimberlite breccia and hypabyssal kimberlite. The B/K12 kimberlite pipe is 800 m north west of the B/K9 pipe and was discovered in mid 1970, from the same 1969 airborne geophysical survey. It was delineated by air drilling below 6 m of Kalahari sand and >6 m of calcrete, again with no surface expression. The pipe is roughly circular with a sub-outcrop area of 3.2 hectares, and a maximum diameter of just over 200 m, decreasing to 2.5 hectares some 100 m below surface. It is composed of a soft, uniformly textured kimberlite composed of sedimentary crater facies infill to a depth of at least 90 m, which differs little from the underlying diatreme facies tuffisitic kimberlite breccia. Wallrock inclusions total around l0%, with up to 50% in localised lenses of basalt/sandstone breccia. The B/K15 kimberlite was discovered as a heavy mineral soil sampling anomaly in early 1972. It is situated 35 km north of Letlhakane village on an escarpment bounding a prominent salt pan, and is overlain by 2 to 4 m of barren shoreline gravels, with no topographic expression of the pipe. The kimberlite is saturated with saline brines from about 14m below surface. In sub-surface it has an area of 2.5 ha, reducing to 1 ha at a depth of 100 m. The kimberlite is very soft and highly altered near surface, with up to 15% of altered basalt/dolerite/basement wallrock xenoliths. Apart from becoming harder and darker, there is no other obvious change in kimberlite facies with depth, which can generally be described as a diatreme facies tuffisitic kimberlite breccia. The Letlhakane diamond mine is located about 190 km west of Francistown, and 50 km from the Orapa mine in north-central Botswana, in southern Africa. The 90 Ma Letlhakane D/K1 kimberlite was intruded into units of the Mesozoic Karoo sequence during the Cretaceous period. Wallrocks of this sequence comprise 130 m of Stormberg basalt flows, overlying 120 m of Ntane Sandstone, which in turn overlies grey siltstones, shales and carbonaceous shales. Four to ten metres of Kalahari sand and calcrete masked the Karoo basalt and originally covered the kimberlite. Large xenoliths of basalt are common and in some places make up more than 90 per cent of the volume of the kimberlite. Three different distinct episodes of intrusion have been recognised in the D/K1 kimberlite. The first intrusion was responsible for a kimberlitic basalt breccia, which is only present in the south of the pipe. It is probable that some of this breccia is sedimentary, having fallen or been washed back into the original crater. More than 90 per cent of the kimberlitic basalt breccia consists of angular blocks of basalt set in a matrix of kimberlite material and finely ground basalt. The second intrusion sharply truncated the kimberlitic basalt, and much of the material from the first intrusion would have been ejected from the pipe or incorporated into the second intrusion. The ore formed by this intrusion is termed LM2 (Letlhakane Mine 2). It has a highly variable basalt content, ranging from less than 5 per cent to greater than 80 per cent. It is generally shades of blue/green/grey and is usually a fresh, hard competent rock. The third intrusion cut through the second, although the contact is not sharp or easy to recognise. This intrusion comprises the northern half of the pipe and its ore is known as LM1(Letlhakane Mine 1). At elevations higher than 950 m above mean sea level (a.s.l. ), the ore is a grey colour with a consistently low basalt content (less than 10 percent) and is intensely weathered to a very friable rock with sub-horizontal calcite and talc/chlorite veining. Below 950 m a.s.l. the ore is of blue/green/grey colour, and is fresh, hard and competent. The Letlhakane mine commenced operation in 1977 and in 2002 produced 1.03 million carats of diamonds from 3.6 Mt of ore at a recovered grade of 25.7 cpht. Some 15.23 Mt of waste was also removed. The average value of stones recovered in 2000 was 191 USD per carat. In 2000 the total reserves + resources were 62.5 Mt @ 26 cpht of diamonds (=16.25 millions carats). The Letlhakane diamonds are the most valuable per carat in Botswana. The Jwaneng diamond mine, is located approximately 170 km south west of Gaborone in the south-central part of Botswana. Detailed exploration by De Beers in the 1960s, found a number of diamondiferous kimberlites, including Orapa and Letlhakane. Jwaneng, also discovered during this campaign, commenced operation in 1981-2. Jwaneng, is said to be the world s richest diamond mine and produced 14.3 million carats of diamonds in 2003. At current mining rates the open pit alone is expected to continue production until 2029. In 2002 Jwaneng recovered 13.035 million carats of diamonds from 9.3 Mt of ore at a recovered grade of 124.7 cpht. Some 36.6 Mt of waste were also stripped. In 2000 the average value of stones recovered was USD 108 per carat. Reserves + resources in 2000 totalled 288 Mt @ 143.5 cpht diamonds (=413 million carats). The Jwaneng diamond mine is based on three pipes, which coalesce near the current land surface to form a single body with a surface expression of 52 ha. Together, these three pipes form the largest of the kimberlites discovered in the area. These pipes are part of a larger cluster of 11 kimberlites that were emplaced at about 235 ±4Ma on the NW rim of the Kaapvaal block. The kimberlites intruded shales of the Transvaal Supergroup during a period of active erosion of the sandstones and conglomerates of the Waterberg Group. All three pipes exhibit a steep sided shape, although, unlike more typical kimberlites, the Jwaneng pipes are filled with crater facies material to a depth of 600 m. No in situ diatreme or hypabyssal facies kimberlite has been exposed to date. The dominant infill in all three Jwaneng pipes consists of reworked volcaniclastic kimberlite and do not contain any evidence to suggest they were post-eruptive depositional centres with crater lakes as at Orapa and Mwadui. Each pipe has a distinct geology and diamond grade signature, the broad features of which are briefly summarised below. The North Pipe comprises a central core of primary pyroclastic kimberlite, surrounded by a peripheral zone of pale brown to brown volcaniclastic material which have been interpreted as representing reworked volcaniclastic debris from the tuff rings. The Central Pipe is filled with brownish green to grey (when fresh) massive to well-bedded, graded deposits, predominantly representing reworked volcaniclastics, although the characteristic pyroclastics seen in the North Pipe are absent. The South Pipe has a very similar structure and appearance to the Central Pipe, but is characterised by more internal variation and more distinct internal facies than that pipe. Debswana Diamond Company (De Beers 50%, Government 50%) is by far the world's largest diamond producer by value. Debswana's diamond mining operations are situated at Jwaneng, Orapa, Letlhakane and Damtshaa. Jwaneng is the richest diamond mine in the world and is situated 170 kilometers west of the capital Gaborone. Orapa, Letlhakane and the youngest Damtshaa mines are located roughly 240 kilometers west of Francistown. The Orapa pipe is the world's second largest diamond-producing kimberlite pipe. In 2005, Debswana Mines produced a total of 31,9 million carats; Jwaneng Mine recovered 15,6 million carats; Orapa Mine recovered 14,8 million carats; Letlhakane Mine recovered 1,097 million carats; and Damtshaa Mine, 246,278 carats. Total revenue In 2005 was P15,8 billion or US$2,7 billion. De Beers is involved in early stage and advanced projects in many areas in Botswana and has numerous joint venture partners including Falconbridge, AfriOre, Ampal, Cratonic Resources, Gallery Gold, Wati Ventures, Firestone Diamonds and African Diamonds. The evaluation of the AK6 kimberlite pipe is in progress for Boteti Exploration, a joint venture between African Diamonds and De Beers. De Beers began the deployment of its airship based exploration technology in Botswana in late 2005 with encouraging results. African Diamonds plc (AFDM.PK, AFD.L, also active in Sierra Leone, Guinea and Congo-Kinshasa) has a a joint venture with De Beers in the Orapa area of Botswana. There are over 40 known kimberlites in the vicinity. A larger scale bulk sampling program carried out on AK6 in 2005 by the De Beers/African Diamonds joint venture yielded a grade of 24 cpht. The kimberlite pipe is now believed to be 9,9 hectares in size containing 48,5 million tonnes, with a modeled diamond value of $150 per carat.The AK6 project is in the pre-feasibility stage. Production is expected to begin in 2009, with an annual yield of 2,5 million tons, which will increase in 2011 to 4,5 million tons annually. Kimberlite AK8 at Orapa is in an advanced stage of exploration. Another six kimberlites are at the sampling stages. Afican Diamonds announced in September, 2007, that it is to submit a mining license application for its AK6 diamond prospect in Botswana, a project estimated to produce 1 million carats of diamonds per year when in full production in 2011. In terms of an agreement, De Beers will take about 66% control of AK6 through a joint venture company Boteti. This is following completion of the bankable feasibility if financed. African Diamonds has a 28% stake in Boteti with the balance held by Debwat. Capital required for the mine is $220m of which $165m will be raised in project finance by Boteti. African Diamonds' required equity will be advanced by De Beers in a $55m repayable loan. Motapa Diamonds Inc (MTP.V;MTP-WT.V) holds 35 prospecting licenses, 100% ownership over 28 PL's (1,77 million hectares), 60% over 7 PL's (0,48 million hectares) in joint venture with AfriOre Botswana (Pty) Ltd.Motapa has entered into a joint venture agreement with Stornoway Diamond Corporation, under terms in which Stornoway has a right to earn a 50% participating interest in a portion of Motapa's Botswana land package by meeting certain vesting requirements, including the funding of US$2m in exploration expenditures and the transferring to Motapa of US$1m in Stornoway shares. Firestone Diamonds plc (FRDIF.PK),mines alluvial deposits in South Africa) has been awarded a prospecting right on the BK11 kimberlite with indicated grades of between two and 17 carats per hundred tonnes. It is in the Orapa area with a new mine being developed five kilometres away at AK6. The company also has joint ventures and is involved in early stage exploration in the Mopipi area, 50 km to the west of Orapa mine. In 2007 the company announced that it had discovered 4 new kimberlites at the Tsabong area project, 280 km southwest of Jwaneng. Firestone subsequently reported that the estimated size of the BK11 kimberlite had increased from 6,5 ha to 8 ha. The company announced in December, 2008, that it had discovered 13 kimberlites to date at the Tsabong project in Botswana. The number of kimberlites in all license areas had reached 92, 23 of which are diamondiferous. DiamonEx Ltd (Australian, ASX:DON: BSE:DIAMONEX) is developing the Lerala diamond resource; comprising five diamondiferous kimberlite pipes which were originally discovered in the late 1980's by De Beers. The estimated Indicated Diamond Resource to a depth of 110m from surface, is 13.5 million tonnes at a grade of 27,41 carats per hundred tonnes. This represents approximately 3,7 million carats of diamonds. SouthernEra Diamonds Inc. announced on 28 March, 2007, that it had acquired a 55% interest in the BK16 kimberlite pipe located within the Orapa Kimberlite Field. Under the agreement, SouthernEra has the right to earn up to a 70% interest in the project by funding exploration to the completion of a definitive feasibility study. BK16 is located 40 kilometers to the east and 12 kilometers to the north of De Beers' Orapa and Letlhakane diamond mines, respectively. SouthernEra has entered into an agreement with Kenrod Engineering Services (Proprietary) Limited, a Botswana registered company which owns the BK16 prospecting license. Tawana Resources NL (Australian, TWNAF.PK) has been awarded a prospecting licence over eight kimberlites in the Orapa district of Botswana. The Orapa kimberlite field is one of the largest diamondiferous kimberlite fields in the world, containing 79 known kimberlites, of which the majority has been proven to be diamondiferous. Pan African Mining Corporation announced in May 2007 that the Botswana Geological Survey had granted six Prospecting Licences to its local, wholly-owned operating subsidiary PAM Botswana (Pty) Ltd. These three-year licences, form two separate diamond exploration target blocks, with a combined area of 5476 km2, located in the Ngamiland area of northwest Botswana. Selection of the prospects was based upon screening of remote sensing and aeromagnetic data as well as geochemical data. The newly licensed blocks contain a cluster of bulls-eye circular features aligned along a lineament. These features possess characteristics closely comparable to those associated with known sub-Kalahari kimberlites. One of these circular targets has an outer diameter in excess of 600 metres. The company reported in January, 2008, that it had completed the first phase of geochemical sampling on its Fairy Ring and Okavango Projects in the Northwest of Botswana. Each comprises three Prospecting Licences aggregating approximately 3000 sq. km, for a total area of some 6000 km2. The company's Okavango licenses are adjacent to claims recently acquired by De Beers in Botswana, and that company's Namibian affiliate (Namdeb) in neighbouring Namibia. This activity has been stimulated in part by an increasing consensus that the Congo craton, which hosts important economic diamond deposits, extends into northwest Botswana. Furthermore, this area is strategically located close to two major surface concentrations of diamonds and G10 garnets in the vicinity of Omatako and Tsumkwe, to the west in Namibia. It could therefore host the primary kimberlite sources of these two important unexplained kimberlite pathfinder anomalies. Petra Diamonds Ltd announced in May, 2007, that it had found a new kimberlite within its license areas and identified 20 new "highly encouraging" targets in its Orapa North licence block in Botswana. The company also said it had acquired two new prospecting licences in the Jwaneng area which hold two known diamondiferous kimberlites. Gem Diamonds Ltd [LSE:GEMD] announced on May 29, 2007, that it had bought Gope Exploration Company (GEC) from De Beers and a subsidiary of Xstrata for a cash consideration of $34-million, or R241-million. GEC was a De Beers Prospecting and Falconbridge Exploration Botswana joint venture, which focused on exploring a known kimberlite pipe in central Botswana. It has an indicated resource of 79 million tonnes down to 400 m below surface at a grade of 19 carats per hundred tonnes. A parcel of 3 400 carats recovered during sampling by De Beers was valued at $121/ct. Tsodilo Resources Limited's (TSX Venture Exchange: TSD) Botswana licenses are proximal to two major unexplained surface concentrations of diamonds and G10 garnets across the border in Namibia, one near the village of Tsumkwe and another in the area known as Omatako. The characteristics of these kimberlite pathfinder mineral anomalies indicate that they are secondary concentrations derived from respective primary high-grade kimberlite sources located elsewhere. The geomorphological model envisages that the Tsumkwe and Omatako pathfinder anomalies were formed by ancient rivers transporting diamonds and garnets derived from kimberlites located in the Company's license blocks. Prior to the deposition of the superficial Kalahari sand that covers much of Ngamiland, this area formed a topographic high. Rivers rising off this high ground flowed westward into a major inland sea located in the north of present-day Namibia. The Company's diamond targets cover former headwaters of this ancient river system and lie within the southern margin of the Congo craton. The 2007 drill program was completed in mid-December, and 15 target anomalies in the Nxau Nxau field have been confirmed as kimberlites. 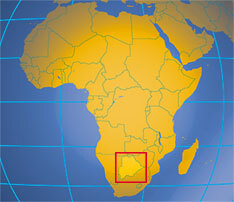 In May 2012 a 249 sq km block was awarded to Botswana Diamonds plc. This forms part of the Orapa kimberlite cluster. The work so far has included high resolution geophysics which has been completed revealing a high concentration of diamond indicator minerals. Drilling commenced in Febraury 2013 and results were expected in May 2013.The company has also partnered with Alrosa who have new technologies and approaches never used in Africa before. The objective of the joint work is to identify large diamondiferous kimberlite pipes with the potential to become high-volume, high-value long life mines. Geophysical data has been processed and geochemical data collection has been completed. Thirteen targets have been identified and twelve licences have been applied for. First awards expected in Q2 2013. In February 2013 an option was signed on the Gope Licence Block covering 13 licences close to the Ghagoo mine and Petra's X-36 project. If results are favourable Botswana Diamonds will negotiate a JV with the licence holders..
Pangolin Diamond Corporation 7 projects are 100% owned encompassing eight project areas that cover over 10,705 square kilometres: Tsabong North, Jwaneng South, Lorolwane, Mmadinare, Malatswae, Rehoboth, Machaneng South and Motloutse River. The supracrustal Archaean granitoid-greenstone for­mations of northeastern Botswana are the host to almost all the known gold resources and mining activ­ities in the country. The occurrence of gold in the Tati greenstone belt is of great historic interest. Gold was first discovered here by Carl Mauch in 1866, and mining commenced in 1869 at the Monarch Mine. It was largely as a consequence of these discoveries that the territory became a British Protectorate in 1888, then known as the Bechuanaland Protectorate. Botswana became an independent republic in 1966. Gold production in 1997 totalled 150 kg, an increase in 7 per cent over that for 1996. The Tati Greenstone Belt forms part of the western exten­sion of the Zimbabwe Craton into northeastern Botswana and is the main host to gold mineralisation in the country. The belt extends from about 10 km north of Francistown in a southeasterly direction for over 70 km, with a maxi­mum width of 30 km. Prospecting and small-scale min­ ing was carried out in the Tati belt by indigenous work­ ers prior to the arrival of European settlers. Although there are no written records from this period, evidence for such activity has been found at nearly all of the sites which have subsequently been worked (Aldiss, 1989). The Tati Greenstone Belt consists of a synformal enclave of greenschist facies metavolcanics and metasediments, within an area of amphibolite facies tonalitic gneiss (Aldiss et al., 1985). Within the Tati Belt a broad upward trend is recognised from ultramafic and mafic rocks at the base, through intermediate lava, felsic porphyries and tuffs, to an upper sedimentary unit. This sequence is basically similar to that recognised in Zimbabwean greenstone belts. The Tati Belt is divided into five litho-stratigraphic units. They are, in order of decreasing age, the Old Tati, Lady Mary, Phenalonga, Last Hope and Selkirk Formations. The Old Tati Formation is confined to the southeastern portion of the belt. It consists largely of ultramafic schist intercalated with serpentinite, banded iron formation and quartz-sericite schist (Aldiss et al., 1985). The presence of spinifex textures in the ultramafic units is indicative of an extrusive volcanic origin. The Lady Mary Formation crops out along the southern and eastern mar­ gins of the Tati Belt. It consists largely of metabasalts which contain well-preserved pillow structures. Thin units of quartz-sericite schist and banded iron formation are locally developed. The Lady Mary Formation is extensively intruded by metagabbro sills. The majority of the defunct gold mines in the Tati Greenstone Belt occur in this Formation. The contact with the overlying Phenalonga Formation is marked by a thin, but exten­ sive, exhalite consisting of banded chert, ferruginous limestone and massive pyrite. The lower portion of the Phenalonga Formation consists of inte ediate tuffs intercalated with calcareous schist and thin limestone units. These are overlain by a kyanite-sillimanite-bear­ ing aluminous schist horizon. The upper portion of the Formation consists of andesitic lavas intercalated with dacitic lavas/tuffs, carbonates and banded iron forma­ tion. Towards the northwest the proportion of felsic units increases and these are extensively intruded by gabbro sills. The Phenalonga Formation rock units are thought to be indicative of an island-arc environment (Aldiss et al., 1985). The Last Hope Formation is a mixed sedi­ mentary unit consisting of tuffaceous psammites, semi­ pelites and graphitic pelites, with intercalated units of banded iron formation. Rock units of this Formation are interpreted as representing alluvial fans which devel­ oped along the faulted margins of the Last Hope basin. The Selkirk Formation contains porphyritic dacite and fine-grained non-porphyritic rhyolite, with intercalated pyroclastic units. These are intruded in the north by fel­ sic porphyries. A major tectonic zone (Matsiloje-Francistown Tectonic Zone) of about 8 km in width separates the Tati Greenstone Belt into two major tectonostratigraphic ter­ ranes: a granitoid terrane to the north, and the main vol­ canosedimentary terrane to the south (Tombale, 1993). The southern terrane of the Tati Greenstone Belt has two dominant structural trends which have been used to subdivide the belt into two main zones. The strike of the rocks in the Western Structural Zone swings from west (in areas west of Francistown) to southeastwards (fur­ ther south and east ofFrancistown), producing a gener­ al northwest trend. The dominant north-north­ east-south-southwest structural trend of the Eastern Structural Zone is almost at right angles to that of the Western Structural Zone. 5. Disseminations in structurally disturbed areas, e.g. Golden Eagle. 434 m below surface (Ruffini, 1998b). A major shear zone, near the granite-schist contact, contains the auri­ferous quartz reefs in schists of the Phenalonga Formation. The auriferous quartz reefs are lenticular, but generally conformable with the schistosity, and dip west at about 85°, varying from 0,5-3,0 m in thickness (Baldock, 1977). Although the principal sulphide miner­ai present is pyrrhotite, most of the gold is associated with pyrite and chalcopyrite (Aldiss,, 1989). Arsenopy­rite, graphite and bismuth minerals are also present. From 1869 to 1910 mining exploited the limited super­gene ore with grades of around 17 g/t. Underground mining by Tati Gold Fields from 1934 to 1947 produced 6,26 t of gold from 1 Mt of ore, inferring an average grade of 6,26 g/t. It was mined from 1989 to 1994 by a small South African syndicate until it was bought out by Gallery Gold and a joint-venture partner. Gallery became the sole owner in September 1995 (African Mining, 1997a). 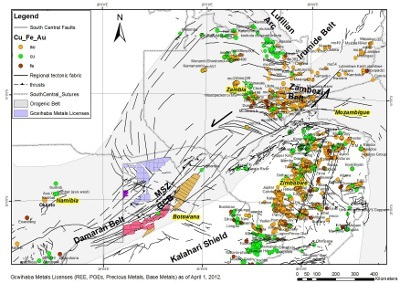 Since October 1995 a diamond and reverse-circulation drilling programme on the main reef at Monarch demonstrated the continuity of the reef, but there were insufficient intersections to provide a reliable estimate of the average grade. A more extensive pro­gramme of underground mapping, sampling and drilling is required before Gallery Resources can make a deci­sion to recommence production. In the meantime, the Monarch remains on care and maintenance. As at June 1998 the total identified resource was 2,13 Mt at 5,4 g/t Au, with potential for a further 660 000 t grading 5,3 g/t beneath the 10 th level of the mine (Resource Infor­mation Unit, 1999). The area was explored extensively by Phelps Dodge in the late 1980s. Small underground and open-cut workings were developed and a decline sunk to 60 m before the company withdrew from Botswana. The Western Australian company Gallery Resources became sole owner in September 1995 (Resource Information Unit,1999). In 1996 Gallery completed a two-phase drilling programme at Golden Eagle, followed by a metallurgical and engineering study which led to production at the mine being restarted in October 1996. In July 1997 the company suspended underground mining operations owing to the poor gold price, but the heap leach opera­ tion continued until June 1998, when it, too, was suspended. A final gold smelt was completed in July 1998, bringing the heap leach operation's total production to 55,2 kg since December 1996 (Resource Information Unit, 1999). Gallery reported that further production would depend on the price of gold and the availability of additional ore reserves in the area. The mine has estimated reserves of 900 000 t averaging 2,6 g/t Au accessible by opencast mining (Chadwick, 1998). An additional 75 kg of gold is present in the 79 400 t heap. Ores are high in arsenic and tungsten. Mineralisation is in the form of disseminations, not veins, in the shear­ zone contact between the Lady Mary and Phenalonga Formations (Baldock, 1977). This elliptical shear zone measures 700 m by 200 m. Some lenticular sulphide­ bearing quartz veins are also found in strike-slip shear zones located on the hinge of an anticline. The host rocks are amphibolite, actinolite schist (Lady Mary Formation) and meta-andesite (Phenalonga Formation). For the Map Nora Mine, first worked in the 1800s, the main period of production was during 1933-1947. Refractory ores grading about 7,8 g/t (Elevatorski, 1995) were last mined during 1987-1991 by Phelps Dodge as the main source of ore for its Botswana gold operation. Problems with metallurgical recovery from this refracto­ ry ore led to the closure of the operation in 1991 (African Mining, 1997a). Gallery Gold became the sole owner in September 1995 (Resource Information Unit, 1999). The underground workings are located about 8 km south of Francistown, where the gold-bearing reefs are confined to shear zones and are typically 0,5 to 1,0 m wide. Host rocks are metabasalt and quartz-sericite schist of the Lady Mary Formation that have been regionally metamorphosed to low-grade amphibolites. Ores are rich in arsenopyrite, with moderate amounts of pyrrhotite and lesser amounts of pyrite. Within a siliceous core, the antimony minerals berthierite and gudmundite have been identified. The deposit has 515 000 t of refractory ore grading 10,4 g/t Au (Ruffini, 1998b). The Bonanza Mine workings are about 24 km southeast of Francistown. There are two main mineralised clusters. Veins trend north-northeast and are 10 to 50 m apart with dips of 65° to 80° northwestward (Chatupa, 1998). The country rock is amphibolite, with the mineralised zone near the contact between the Lady Mary and Phenalonga Formations. Mineralisation is associated with pyrrhotite and pyrite, with minor amounts of chalcopyrite. Veins up to 2 m wide were reported to contain up to 31,1 g/t Au (Elevatorski, 1995). Reserves of some 75 000 t at 31,5 g/t have been estimated (Aldiss eta!., 1985). Near the southern end of the Tati Greenstone Belt, auriferous quartz reefs occur in metamorphosed volcanics of the Lady Mary Formation. The New Zealand Workings are about 40 km south ofFrancistown. The New Zealand Mine was one of the more important gold producers in the Tati Gold Field, with some of the richest ore return­ ing 75-90 g/t Au (Key, 1976). Estimates of the depth of the mine are conflicting and range from 100-360 m. Gold-bearing reefs at the mine which dip steeply to the south, probably lie within a regional isoclinal fold, but are dissected by younger dolerite. Remaining reserves are thought to be relatively small (Baldock, 1977). Approximately 30 000 t of fines grading about 1 g/t Au remain in the dumps (Key, 1976). The Rainbow Mine is about 12 km east-northeast of the New Zealand Mine. Mining at Rainbow was carried out on three, more or less parallel, quartz reefs, aligned paral­ lel to the regional schistosity over lengths of about 200 m. Reserves at the mine are estimated at over 18 000 t grad­ ing about 10 g/t over 0,9 m . More veins, than the three parallel quartz reefs that were mined in the past, are thought to lie at greater depth and the mine could have some economic potential. In 1997 Kudu Mining was seeking a partner to fund and complete a two-year explo­ ration programme, leading to a joint-venture agreement at Rainbow (African Mining, 1997b). The Blue Jacket Mine is 3 km north of the Tati River. Extensive old workings over a strike length of300 mare evidence of the prospect's gold potential. Blue Jacket comprises a sequence of quartz veins in a shear zone cut­ ting talc-tremolite schist of the Old Tati Formation, and intermediate andesitic schist and tuff of the Phenalonga Formation. The ore zone, diping south and trending east-west, is largely confined to the Phenhalonga Formation. Ore grades range from 5,4 g/t to 47,6 g/t Au (Chatupa, 1998). The New Prospect Mine area is situated 3,5 km to the south and southwest of the centre of Francistown. This area has an extensive network of old pre-European and European gold workings, which testify to the richness of the prospect. Mineralisation in this area has been traced overr a strike length of 600 m along a set of northwest-trending shear zones, close to the contact of the Airfield Tonalite and the Lady Mary Formation (Chatupa, 1998). The shear zones are slightly discordant to the regional schistosity and they dip to the west at 70°. Generally the mineralised reefs are in chlorite-actinolite schist of the upper part of the Lady Mary Formation. Average grade is 2,12 g/t Au. Jim's Luck is an old open-pit gold mine located in the banded iron formations of the Matsiloje range of hills. The open stope is approximately oval shaped (15x40 m) and 27 m deep. It appears that the open stope probably defined a small, discrete ore body in a fold nose at a banded iron formation/meta-andesite contact from which 7 000 m3 of ore were excavated (Chatupa, 1998). Mineralisation occurred in a steeply plunging shoot at the intersection of the northsouth-trending banded iron formation and a southeast-trending fault. The White Elephant workings appear to date back to the pre-European period. They consist of 14 shafts and a number of open stopes and trenches over a strike length of 700 m. Ore shoots, 2-3 m thick and 15-40 m in length, occur in an eastwest-trending shear sone hosted in a talc-chlorite schist, which strikes east-northeast. Gold Fields sampled the shear and found that the highest gold results (ranging from 2,23 g/t to 28,85 g/t) are in pyritic quartz-carbonate veins (Chatupa, 1998). The last record of activity at Vemaak Mine dates from 1955 when the mine is reported to have produced 1,19 kg (38,37 oz) of gold and 0,2 kg (6,51 oz) of silver (Chatupa, 1998). The Vermaak workings are on a quartz reef of very variable width, ranging from 0,15-3,0m at the surface. The reef strikes approximately east-west, and has an almost vertical dip. The Helstone Gold Mine was developed on the same location where shallow pre-European mining had taken place between 700 and 1200 A.D. In the 18th and 19th centuries the mine appears to have initially been operated by the Tati Blue Jacket Syndicate until 1907. Thereafter it was taken over by the Vermaak Syndicate, who extended the mine to the 27-m level, where grades of up to 17 g/t Au over 0,9 m were attained. Thirteen reefs with an approximately east-west strike are hosted in andesites of the Phenalonga Formation. They dip 65-70° to the south. Strike lengths vary, with the longest one extending up to 70 m.
The Cherished Hope Prospect is located 13 km southeast of Francistown. It is hosted in a mafic shear zone cutting the Francistown Tonalite. The mineralised fissure veins extend 150m to the northwest, and they are up to 2m thick. The Mambo Prospect, some 5 km north of Francistown, comprises en echelon quartz-vein reefs in a north-south­ trending shear zone. The reefs and the wall rock have both been extensively chloritised and mineralised over a strike length of 500 m.
A fissure-vein system cutting the Francistown tonalite occurs 3 km west of Francistown. The veins strike north­east and dip to the southeast. Mineralisation is associated with gossanous pseudomorphs and pyrite in vugs and fractures in the quartz veins which are up to 10 m long and 1 m thick. Some of the veins yielded assays of gold up to 19,2 g/t (Chatupa, 1998). Pyrite is also disseminat­ed in the wall rock, close to the quartz veins. En echelon fissure veins also occur along the tonalite­ metaphyllite contact, 0,7 km southeast of Francistown. Host rocks are the Francistown tonalite and a fine grained felsic rock with needles of actinolite. The veins strike northwest and dip steeply to the northeast. They are accompanied by extensive ferruginisation, bleaching and chloritisation of the wall rock. The iron-stained vein quartz has yielded up to 13,8 g/t Au (Chatupa, 1998). The wall rock, however, appears to be barren. The Christmas Kop mineralised fissure veins, 11 km northwest ofFrancistown, are hosted in amphibolite and quartz-biotite gneiss. They form a conjugate set of quartz veins trending north-south to northeast, oblique to the regional schistosity. The veining is associated with extensive ferruginisation of the wall rock amphibolite. The Durham Prospect lies 6,5 km south-southeast of Francistown among a group of several old workings. Gold distribution was very erratic. The Durham reef is best described as a 'bedded vein', lenticular and very narrow (Chatupa, 1998). The Phoenix Mine is situated 10 km south-southeast of Francistown. It is known to have been worked in 1938 by Lady Mary Estates and descended to over 120 m. Mineralised veins are hosted in shears. The Selwyn workings are 6 km north of Francistown. Several thin quartz veins (0,5-20 m) occur in a north­ northwest-trending shear system. This greenstone belt extends southwards from Kahka­ mate, which is about 60 km north of Francistown, and has an estimated thickness of 6-8 km. Several targets of gold mineralisation have been delineated in the belt, but have so far not received as much attention as the Tati. There are two major volcanosedimentary cycles that have been discerned (Chatupa, 1998). They rest on the basement of the Vuki-Titume Meta-arkose Formation. In the lower cycle there is a sequence of komatiitic ultra­ mafic lavas of the Sebina Ultramafic Formation. They grade into tholeiitic members, classified as the Lower Mafic Formation, some 2 000 m thick. At the top of the cycle is a mixed bimodal tholeiitic calc-alkaline and sed­ imentary sequence - the Mixed Volcanic Formation. This formation is over 3 000 m thick. The upper cycle also begins with a komatiitic to tholeiitic series of lavas, culminating with the deposition of intercalated felsic volcanics and sediments. 3. Gold within shear zones. At the Somerset Mine, quartz veins extend over a 200-m strike length, with an average thickness of about 1 m. Host rocks are quartzose amphibolite. The old workings are in a zone of supergene enrichment, with an ore grade of about 5 g/t. Dumps contain on estimate 10 000 t of fines assaying at more than 1 g/t Au (Boocock, 1965). Additional surface rubble (2 500 t), grading approxi­ mately 5 g/t Au, has been revealed by detailed sampling (Baldock, 1977). The Galatea Workings are situated in the eastern part of the Vumba Belt and probably date back to the gold mi­ ning boom of the 1890s in northeastern Botswana. Mineralisation is emplaced in a shear zone at the contact of a granodiorite intrusion with amphibolite schist and is largely associated with quartz veining. The strike length of the mineralised zone is about 40 m.
The arcuate Matsitama Greenstone Belt is situated some 55 km west-northwest of Francistown. Although it is similar in age and tectonic setting to the Tati and Vumba belts, it differs from them in that metasedimentary rocks predominate, and intermediate and felsic metavolcanics are virtually absent. The atypical nature of the Matsitama Belt has to a large extent reduced the potential of this area as a target for gold mineralisation (Chatupa, 1998). In the Bamangwato Tribal Territory at least 15 to 20 minor occurrences are known where minor amounts of gold occur in association with cupriferous quartz veins. The main localities are in the Bushman Mine area, the Tonota area, the Serule area, and the Mamakubo area (Boocock, 1965). 1 km. Average gold values are about 3 g/t (Baldock, 1977). The western part of the Phitshane area was investigated by Billiton Botswana (Pty) Ltd during the period 1979-1982. In the course of soil and rock geochemical surveys, it was found that a ferruginous fuchsite-sericite­ quartz schist, close to the banded iron-formation expo­ sures, is auriferous. Samples of the schist gave maxi­ mum values of 0,5 g/t Au (Aldiss, 1985). Ownership in 2001: Fancamp Resources Pty Ltd 100 per cent The Red Spot (500 km2), Hubble (250 km ) and Tsetseng (750 km ) targets are very large magnetic/gravity anom­ alies representing intrusions or intrusive complexes with potential for hosting giant copper-gold and copper-nick­ el-platinum-group-element deposits. They lie at depths of 500-1 000 m. As at September 1998 these targets were ready to be drilled and Fancamp Resources Ltd was searching for joint venture partners with a view to begin drilling (Resource Information Unit, 1999). A second target group is located on the 100-km-long Mabua Breccia Trend, a shallow structural feature up to several kilometres in width, characterised by very large magnetic and gravity anomalies, and marginal to the Kalahari Suture Zone some 200 km south of the Red Spot-Hubble-Tsetseng Complex. Extensive drilling along this structure has revealed the presence of mag­ netite-rich volcanics, volcanic breccias and dioritic intrusive material showing extensive hydrothermal alter­ ation and, locally, weakly anomalous base-metal values. The breccias are of a similar type to those associated with copper-gold mineralisation at Olympic Dam in Aus-tralia, and Igarape in Bahia Province in Brazil. 1997. As at September 1997, the first phase of drilling was comple-ted and the resources were being evaluated (Resource Information Unit, 1999). 40 km to the south, host the SA-listed Goldridge Mine with resources exceeding 62 t of gold. Most of the licence area is covered by recent Kalahari sands, and specialised exploration techniques are required. 65 per cent of the project by funding all exploration and bringing it up to a bankable feasibility study. At that time Reunion will retain 28 per cent and First Quantum 7 per cent of the project. Reunion reported in January 1998 that it would manage the exploration programme until Ashanti had earned its 50 per cent interest. A phase one exploration programme was completed in 1998 (Resource Information Unit, 1999). A number of soil geochemical anomalies have been identified. In January 1996 Trillion Resources was awarded six gold and base-metal exploration licences in northeastern Botswana covering about 521 000 ha (Resource Information Unit, 1999), and initial compilation and field work began. By 1997, using existing information and the results of an aeromagnetic survey, specific anomalies had been identified. Results were promising. However, owing to the prevailing low price of gold in 1998, field work was stopped, although the exploration licence is to be maintained to allow rapid expansion of activities should conditions change. 4 km long and up to 2,5 km wide, with a peak soil value of 1,8 g/t gold. The Matopi anomaly occurs over strong­ ly silicified and carbonated ultramafic rocks and has a strong associated arsenic response. There are no known old gold workings in the vicinity. The new Molomolo gold-arsenic soil anomaly was iden­ tified by reconnaissance soil sampling in mid-1999. It is located 45 km southeast of Francistown. The anomaly covers an area of approximately 2,5 by 2,0 km. Initial mapping indicates that the anomaly is centred on a major sheared geological contact between strongly altered ultramafic rocks and metasediments, now quartz-mica schist. No old gold workings have been located and this anomaly is considered to be very encouraging. Detailed geological mapping and prospecting of the anomalous areas are currently in progress, with the aim of defming drill targets for testing in the near future. 1999 confirmed the source of the gold mineralisation to be a strongly altered banded iron formation (African Mining, 1999a) and silicified graphitic schists. It pro­ duced encouraging intercepts including 10,3 mat 4,5g/t Au and 55 rri at 1,6 g/t Au. There has been insufficient drilling to define the size potential of the Mupane min­ eralised zones. The Signal Hill deposit was discovered in 1984 when a drilling programme identified four zones of gold miner­ alisation. The property covers a portion of the Tati Greenstone Belt where the greenstone sequence thickens and several major structures intersect. Mineralisation is hosted by shear zones contained in rocks of the Last Hope and Phenalonga Formations. Exploration, includ­ ing grid-based soil sampling and mapping over six his­ toric gold mine sites, was expected to begin in September 1998. As at July 1998, an inferred-indicated resource of 1,74 Mt grading 3,6 g/t Au and a small oxide resource of 751 000 t at 2,64 g/t Au suitable for an open­ cut operation, were reported (Resource Information Unit, 1999). Metallurgical test work has shown the ore to be amenable to extraction by heap leach techniques. The Archaean Tati and Vumba Greenstone Belts have the best potential for gold resources in Botswana. Across the border in Zimbabwe, the Gwanda Belt, a similar green­ stone belt to the Tati and Vumba Belts, has yielded ten times the amount of gold per square kilometre compared with these two belts. This is probably due to the lower level of gold exploration in Botswana, and does not nec­ essarily reflect a poorer endowment. Gallery Resource believes there is good potential to discover million ounce gold deposits in the Tati and Vumba Greenstone Belts. Gallery Gold Ltd (Australian, Frankfurt:GGL.F, and also active in Tanzania) operated the Mupane mine and held a number of known gold properties under prospecting licences. Mupane mine has a resource of 983 000 oz gold and is operating with a planned production of 100 000 oz gold per year. Golden Eagle mine, together with Monarch and Shashe, have a combined resource estimated at 2,1 million t grading 5,5 g/t Au or 362 000 oz gold and are on a care and maintenance basis. The Signal Hill deposit has an inferred resource of 1,68 million t grading 2,2 g/t Au or 119 000 oz gold, of which 56 000 oz is recoverable from open pit. The licences also cover the defunct Monarch and Shashe mines. Galane Gold Ltd acquired the Mupane gold mine in August 2011 when Toronto-listed Iamgold sold it to the TSX-V-listed junior for $34-million in cash and shares. Galane Gold Ltd.'s wholly-owned subsidiary Mupane Gold Mining (Pty) Botswana is a conventional open-pit mining operation with mill and carbon-in-leach (CIL) processing. Operations are situated in approximately 30km southeast of Francistown, in northeastern Botswana. Commercial production commenced in January 2005 with 507,972 oz of Au produced as of September 30, 2011. The CIL plant has a nameplate processing capacity of 1.2 million tonnes-per-annum of oxide ore and 1.0 million tonnes per annum of sulphide ore.The operation is currently producing approximately 50,000 ounces of gold per annum. Tawana Resources NL (TWNAF.PK) has been investigating the Somerset deposit (alluvial) which has an indicated one million t of gravel at a reported average grade of 2,85 g/t Au. Central African Gold plc (AIM:CAN) is exploring the extensions of the Kraaipan Greenstone Belt in southern Botswana at their Kraaipan and Mabule projects. Aquentium, Inc. announced on 27 September, 2007, that the company had signed a joint venture agreement with Mootah Energetic Pty. Ltd. for the exploration and mining of gold and uranium in Botswana. Under terms of the agreement, Aquentium, Inc. and Mootah Energetic Pty. Ltd. have the exclusive rights to prospect for gold and uranium for an initial period of three years. The mining concession was granted by the Minister of Minerals, Energy, and Water Resources of Botswana and covers an area that is five hundred seventy two point six square kilometers (572.6 km2) located in southern Botswana. Nickel sulphide mineralization, which is associated with pyroxenite sills, and gabbro-hosted mineralisation such as Phoenix, Selkirk and Tekwane, near Francistown. The Phoenix mineralization is a co-magmatic sulphide deposit hosted by a meta-gabbroic intrusion. Mineralization is comprised of a series of stacked sub-parallel, sub-horizontal, discontinuous massive sulphide lenses, in association with meta-gabbro hosted disseminated sulphides. Mineralogically, the sulphide ore comprises on average 70% pyrrhotite, 20% pentlandite, and 10% chalcopyrite. The tenor of the massive sulphides can be as high as 8% nickel. The mineralization hosts significant Platinum Group Metals (PGM). In its original form the Selkirk massive sulphide body, located 15 km south of Phoenix, was a shallow (25° to 35°) plunging zone of massive sulphide mineralization approximately 200m long, 100m wide and up to 20m thick. The massive sulphide ore body pinched out at 150m below surface. Mineralogically, the massive sulphide deposit was comprised of approximately 77% pyrrhotite, 10% pentlandite, 10% magnetite and 3% chalcopyrite, and graded approximately 2,6% nickel and 1,6% copper. The sulphide body is surrounded by lower tenor disseminated sulphide mineralization which is open ended down plunge and remains highly prospective. 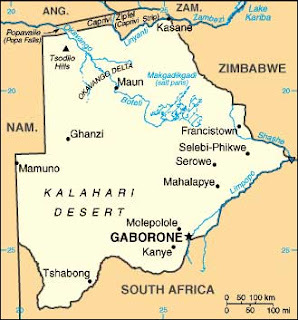 The Pikwe - Selebi (or Selebi - Phikwe) copper-nickel deposits are located in eastern Botswana, 400 km NNE of Gabarone. They comprises three folded tabular orebodies which lie within the Central Zone of the Limpopo Mobile Belt. Ore is hosted by mafic and ultramafic rocks concordantly developed within a thick Archaean sequence of biotite, hornblende and feldspar gneisses, with intercalated anorthositic gneisses, talc-tremolite quartzites and pure quartzite. The three orebodies are spread over a 15 km interval and apparently lie on a single continuous mineralised mafic band. The ore bearing band is from 0 to 45 m thick and comprises an amphibolite hosting mineralisation ranging from disseminated (0 to 40%) to semi-massive (40 to 70%) and massive (70 to 95%) pyrrhotite with associated pentlandite and chalcopyrite. The sulphides and the ore have been strogly deformed, remobilised and recrystallised. Reserves remaining in 1985 were 74 Mt @ 1% Cu, 0.75% Ni, after a startup in 1973 and production rate of 3 Mtpa. 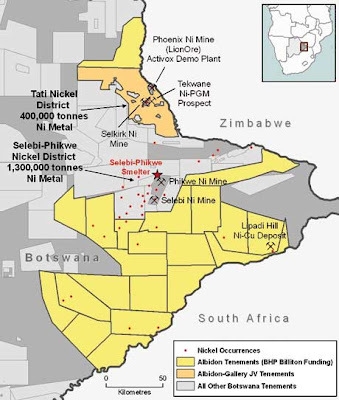 The Phoenix and Selkirk nickel-copper sulphide deposits are 15 km apart and are located approximately 40 km east of Francistown in the Tati area of northeastern Botswana. The Tati area has a mining history that dates back as far as 600 AD, when the gossan outcrops of the present operations were first exploited for copper. The deposits are hosted by the Archaean Tati greenstone belt of the Zimbabwe Craton. The Phoenix sulphide Ni-Cu-PGM deposit comprises a series of narrow, stacked, structurally controlled massive sulphide lenses enveloped within a broad zone of disseminated sulphides hosted by a meta-gabbro intrusion. Individual massive sulphide lenses may have grades as high as 8% nickel, enhancing the lower grade disseminated mineralisation which typically has a grade of around 0.40% Ni. In 2003 the probable mineral reserve at Phoenix was 37.6 Mt @ 0.55% Ni, 0.34% Cu, while the indicated resource was published as 142 Mt @ 0.29% Ni, 0.17% Cu. Production in 2003 involved the removal of 14 Mt of waste and ore, at a waste:ore ratio of 3.9:1. The mill has a capacity to treat 3.6 Mt of ore per annum and in 2003 produced 278,746 tonnes of concentrate at 5.68% Cu, 3.57% Cu containing 11,509 tonnes of Ni, 8,141 tonnes of Cu, 0.102 tonnes of Pd, 0.167 tonnes of Pt, 71 tonnes of Co, 203 kg of Ag 29.5 kg of Au. The Selkirk deposit was mined out by late 2002. It comprised a 30° plunging 200 x 100 x 25 metre zone of massive sulphides grading 2.6%Ni and 1.6% Cu, which extended down to a maximum depth of 150 m below the surface. The massive sulphides were enveloped by a broad zone of low grade disseminated sulphides, hosted by a meta-gabbro intrusion. Bamangwato Concessions Limited (Botswana Government-30%) operates the Selebi-Phikwe mine consisting of Phikwe Central, South East Extension, Selebi North and Selebi. Albidon Ltd's Selebi-Phikwe Project comprises twenty contiguous Prospecting Licences covering approximately 17,466 sq km in the eastern part of the Central District of Botswana. The Project covers prospective ground to the west, south and east of the Selebi-Phikwe Nickel Mining District (>1 million t tonnes contained Ni) and includes numerous Ni-Cu occurrences, including the Lipadi Hill deposit. The project falls within the Exploration Cooperation Agreement signed with Western Mining Corporation (WMC) in October 2004, subsequently acquired by BHP Billiton. As part of this Agreement, WMC/BHP funded and operated the project during 2005, and BHP continued to do so in 2006. Albidon said in November, 2007, that it would start drilling at the Sunnyside and Kgwedi nickel prospects to provide an initial test of the coincident geophysical and geochemical targets, and, in particular, aim to assess whether the anomalies were caused by nickel mineralisation similar to that encountered in the 1970s drilling. The Sunnyside and Kgwedi prospects formed part of an 8 705 km2 tenement package held by Albidon to the south of Selebi-Phikwe district. LionOre (Canadian, TSX:LIM; AIM:LOR; ASX:LIM) has an 85% interest in Tati Nickel with the Government of Botswana holding the balance. Tati Nickel comprises the Phoenix open pit nickel mine and the Selkirk underground mine (on care and maintenance) and was formed in 1988. Mining commenced at the Selkirk underground mine in 1989 and at the Phoenix open pit in 1995. LionOre aquired an initial interest in 1996, which was increased to 85% in 2002 following the purchase of Anglo American's 44,5% interest. In 2005 Tati produced 8,581 t of nickel, 6,807 t of copper, 5,007 oz of platinum and 27,965 oz of palladium. LionOre produced 34,100 tonnes of payable nickel at a cost of $3,76 a pound, will increase output to 44,300 tonnes in 2007 at a cash cost of $3,52. It has a forecast price for 2007 of $7,35 a pound. A pre-feasibility study showed potential for an opencast mine at Selkirk to produce 20,000 tonnes of nickel a year for 13 years. Discovery Metals Ltd (Australian) secured the NE Botswana Nickel Project, through a farm-in deal with Falconbridge Exploration (Botswana) Pty Ltd. This project surrounds BCL Limited's three producing nickel sulphide mines in the Selebi-Phikwe region of Botswana. Discovery can earn up to 80% of the project for exploration expenditure of AUD$2,500,000. Nickel mineralization exists on the project at the Dikoloti and Lentswe prospects. Snowden Mining Industry Consultants have completed a resource estimate of the Dikoloti nickel deposit reporting that the mineral resource is 1,2 million tonnes @ 0,84% nickel and 0,46% copper at a nickel cut-off grade of 0,5% and has been classified in the Inferred category according to the 1999 JORC Code. The company announced in February, 2007 commencement of a drilling program to test ten newly identified conductors at the company's Lentswe and Dikoloti prospects. Botswana Metals Ltd, a 100% subsidiary of A-Cap Resources Ltd, control 4500 square kilometres of exploration tenements for nickel and copper between the nickel mines of Selebi Phikwe to the south and Tati to the north. Previous exploration has suggested potentially targets for follow-up drilling. A-Cap Resources Ltd is exploring the Mokobaesi No. 1 deposit (Surficial, Karoo sandstone). An area of surficial uranium oxide mineralisation has also been discovered during regional grid clearing at the Serule prospect 10km south of the current drilling at Mokobaesi. The mineral occurrence is noted to be largely confined to fracture and joint planes within a fine-grained sedimentary unit of the Karoo Supergroup. This unit is geologically similar to the rocktypes that host the mineralisation at Mokobaesi and Kraken. A-Cap Resources announced in January, 2008, an initial Inferred Mineral Resource at its Mokobaesi and Kraken prospects of 20 million pounds of uranium. The prospects, which form part of the larger Letlhakane Projcet in the North East, come from a resource covering an area of approximately six kilometres (east to west) by three kilometres (north to south) and extends from the surface to a depth of 45 metres. A-Cap was the first company to produce a JORC compliant uranium resource in Botswana with the 100% owned Letlhakane Uranium Project’s current JORC compliant resource standing at 351 Mlbs U₃O₈ (at a 100ppm cut-off). Within this global resource, a higher-grade resource has been defined of 143.2 Mt at 284ppm U₃O₈ for a contained 89.7 Mlbs U₃O₈. This resource positions Letlhakane within the top ten undeveloped uranium deposits in the world. A-Cap is in the process of completing a Bankable Feasibility Study at Letlhakane, which is on target to be completed in 2014, with first production anticipated 2015. Bannerman Resources Ltd is exploring the occurrences at Serule (Surficial) and Dukwe (Surficial) with the aid of 1970's radiometric data of Falconbridge. Energy Ventures Ltd (also in Zambia) is exploring Sese. UraMin Inc (also active in CAR, Chad, Mozambique and Namibia) is exploring the Botsalano Ring Complex. Mount Burgess Mining N.L. is exploring the Kihabe zinc project, located 700 kilometres north west of Gaborone on the Namibian border in “Ngamiland” Botswana. The prospecting licence covers a fault-bounded Proterozoic-aged carbonate sub basin and a significant zinc, lead and silver soil geochemical anomaly is being drilled. Géoressources de l’Afrique :quelle vision et quel modèle de gestion pour un développement durable et une contribution au Nepad ?